Below are some updated pics. 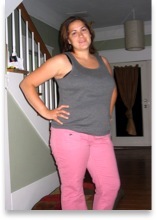 155 lbs and a size 8 jeans!!! 155.6 lbs!!!! I lost 2 lbs!! This means I'm exactly 20 lbs from goal. Oh my.... It feels weird to be so close. I know 20 lbs may not be "close" to some people- but when you started out at 225- IT'S CLOSE!!! It feels good. I have noticed my weight loss slow down the closer I get. I may not be at goal by Christmas, but I'll be thinner than I am now- so that's enough for me. This past week I did bring my daily points down 2 points from 32 to 30. Even though I don't technically need to go down to 30 points until I get below 150 lbs. I felt it was time to got down because I was maintaining my weight instead of having any significant losses for a couple weeks there. But- since I'm nursing, I want to be sensitive to my supply and what I need so if I'm hungry- I'll eat. But 30pt/day is what the plan is. All in all I feel like I'm thinking less and less about food. This is a big lifestyle change for me. It's practically in my genetic makeup to think about food 24/7. It feels odd for me to not be so obsessed over what I'm eating. Heck, at my son's birthday I was so busy talking and watching him have fun that I forgot to eat dinner. But because of that I was able to eat a piece of the yummy carrot cake I made. (Shaped into a dinosaur with cream cheese icing dyed blue, mind you). And I still lost this week! I really can't believe how easy it is now. It's really becoming habit. I don't feel like I'm on a diet. I never feel deprived. Ever. I also have a non scale victory to share. My friend's husband had a single friend that was staying when them a couple weeks ago. Ed and I had gone over there to eat one day and we met him. My friend said the single guy talked about how "attractive Ed's wife is." Apparently he thought I was available before he realized I was married. Well, yes, I'm taken- but thanks for making my day!!! It feels really good to be "hot" again. Ha ha. So, my birthday is Wednesday. Tomorrow night I'm going out to eat at a french restaraunt. I'm planning on spending a lot of my points. I think I'll be eating some cheese and bread and don't forget the martinis!!! Being 155 lbs is the best birthday present I could ever get. I weighed in at 157.6 lbs last night. That's only a .4 loss. :( I know it's still a loss, but I was expecting more. Sunday I got on the scale at home and it said 155 lbs. I was thrilled - as it's been a while since I've had a big loss in one week. Then I stepped on the scale Monday morning and it said 157 lbs. (Day of weigh in). ?? So I decided to research and look back at my tracker and determine why I seem to be slowing down on the weight loss. I had lots of "events" where I did a lot of guessing about point value in the foods. So, I'm moving forward (not dwelling on the past) and I'm making some changes. I'm gonna back off on the Lean Cuisines (sodium) and fast food. I'll reach for fruit instead of fat free pudding. And I'll drop down to 30 pts a day instead of 32 pts. Hopefully that will kick it into gear a bit. This month is a bit challenging because my mother in law, brother in law, Ed, Me and Fischer all have birthdays in October. So there were/are some celebrations that can trip me up food-wise. This Saturday is Fischer's birthday party. I'm making 2 big pots of chili and I'm making him a carrot cake dinosaur cake. So- I'd like to have a piece with him. My goal this week is to save my weekly allowance points until then. Whenever I experience a disappointment in relation to my weight loss journey I really have to resist being too reactive. I have to push myself to focus on the future and not dwell on the past. It's absolutely vital to keep going in order to get to goal. But it's so hard not to slip into past habits. I'm just now remembering what I did when I stepped on the scale Sunday and it said 155 lbs. I thought: "Wow- that's gonna be a 3 lbs loss from last week when I weigh in tomorrow. I think I'll treat myself to a yummy dinner." I had a chili dog and fries. I counted my chickens before they hatched. And even though that chili dog and fries were still under my points (as unbelievable as that is-lol) I still chose unwisely and paid for it on the scale. One thing my leader says is: "You can't fool the scale. Cheating is only cheating yourself- not the scale." Well I weighed in at exactly 158 lbs last night. I was able to celebrate two big things. One, last night was my 16th week attending meetings. Studies within WW show that those that make it to meetings (not just weigh ins) for 16 weeks are usually in it for the long haul and get to goal. I got a charm with two hands clapping. I put it on my 10% keychain. That meant a lot to me to get to my 16th week. And two: I got my 25 lb magnet. I'm down 26 lbs since joining in June. YEAH!!! So it was a successful meeting and very motivating. This week was good but busy. I went to church yesterday and 3, yes THREE, people did not recognize me. I ran into a friend that I hadn't seen since Amelia was about 2 months old. She was talking to Ed and I walked up and said hi. She said hi kinda oddly and then started talking to Ed again. Then she looked back and her eyes widened and she said: "Oh my God! Look at you!" She totally didn't even know it was me when I first said hello. How's that for a non-scale victory? It makes it all worth it... I feel so good about myself lately. It makes it easier and easier to stay OP. Yesterday didn't come without it's challenges though. Ed and I went to the first church service at 9:30am. Then we served in the nursery for the 11am service. I was STARVING and ate a bagel with cream cheese. It was good but 7 points. Dang. Then after that we got lunch at Subway. I was able to control my points there but then we headed to a baby shower after that. Talk about challenging. I had 4 deviled eggs and some pasta salad. By the time we got home it was 4pm and I had 2, yes 2, points left for the day. But, I was determined to stay OP. Luckily I was full from the day's grazing and I decided to go on a walk around 5pm. I put my handy WW pedometer on that can calculate activity points earned for a given activity. I walked until I earned 1 AP. So that left me with 3 points to work with. Better than 2 right? So I took advantage of Weight Watchers infamous No Point Soup I made the day before. I ate a huge bowl of that and downed two glasses of water. I was definitely full. (Now I know why so many people say that soup is the secret to their success). Ed and I got the kids to bed and I sat down with a Smart Ones Mississippi Mud Pie (3 pts) and watched some TV. I did it! I conquered the "it's 4pm and I only have 2 pts" dilema!! I've said it before and I'll say it again. It gets easier and easier to stay OP when you do it day after day. Things that seem impossible really aren't all that impossible. Before I would have thought staying OP with only 2 pts left for the day was impossible. Not so! Put garlic, vegetables, thyme and broth into a large soup pot. Cover and bring to a boil over high heat; reduce heat to low and simmer 10 minutes. Here's a photo progression. Wow. Well I made it into the 150's! 159.2 lbs to be exact. Oh thank God! I lingered in the 160's for way longer than I wanted. I looked back at my weigh in records and I was in the 160's for 6 weeks. That was way longer than the other "decades" I was in. 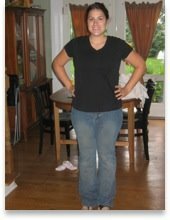 :) I think officially being in the 150's is important for me because it means I'm smaller than I was after I had Fischer. I know I was 147 lbs when I got pregnant with Fischer so I'll shoot for that to be my next monthly goal. I had my weigh in last night and then came straight home and ate a TON of food. It was a planned binge. But I pretty much blew all my weekly allowance points in one fail swoop. I had a pc of coconut cake, 4 oreos, several slices of french bread with yummy cheese spread and nutella. Oh and 3 glasses of wine. BINGE!!! But I don't feel bad because it wasn't an emotional binge fest- it was well calculated. And I accounted for everything that went into my mouth. 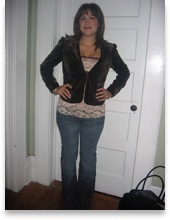 That's the beauty of Weight Watchers. Nothing is off limits. If you want to have a night to just eat, you can. I don't do it often, but every once in a while it's a neccessity. It actually helps keep me on plan. Knowing that I can eat whatever I want within reason. Well October is a busy month for this family. Ed's birthday is the 13th. My mother in law's is the 10th. Fischer and mine is on the 25th. Then Oct 28th through Nov 4th we're going to the beach with some friends of ours. (I know- beach in Oct/Nov doesn't make sense- but it's free and it's a vacation) Luckily these friends know I'm on Weight Watchers and I really don't have any worries about staying on plan while there. For my birthday I've asked for money to spend on clothes! I can't wait to get some new (smaller) things. Well, I've had a week of sleepless nights here lately. Both my babies are sick and my girl seems to be teething as well. So I've not slept well at all in the last week. I wish I could crawl into bed and sleep the day away. Maybe one of these days I'll get smart enough to go to bed early. 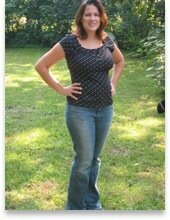 I'll post some new pics soon of my size 8 jeans! !